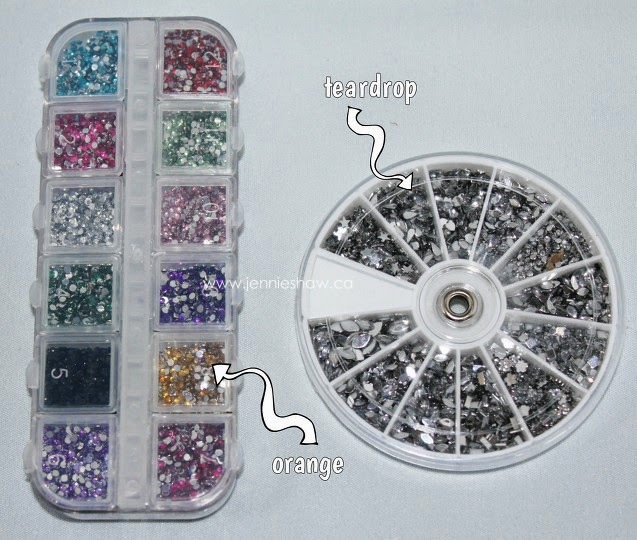 jennie's nails and tales: the nail files: exclaiming my love for rhinestones! the nail files: exclaiming my love for rhinestones! Woot woot! It's nail files time! This week, I just about lost my whole mind when my order of rhinestones finally came! There are blue ones and purple ones and black ones and pink ones PLUS an entire wheel of fun shaped silver ones! Eeeeeeeeee! So, naturally, I spent the next few hours playing around and ended up with a really awesome, but pretty simple mani. For the base coats, I did three coats of At Vase Value and Skinny Dip, and two coats of Paper Mache. Yes, I know, three-coat-base-colours are the worst, but sometimes, a great colour requires it so just make sure that you carve out enough time to let it dry. Or cheat a bit and throw on some quick-dry top coat, which I may or may not have done after the second coat (emphasis on the may, haha!). Once that was dry, I put a drop of clear polish where I wanted the orange rhinestone (with a dotting tool) and then put the rhinestone on top. I used the same technique for the teardrop rhinestone. One coat of quick-dry top coat sealed it all in and made everything all shiny and awesome. 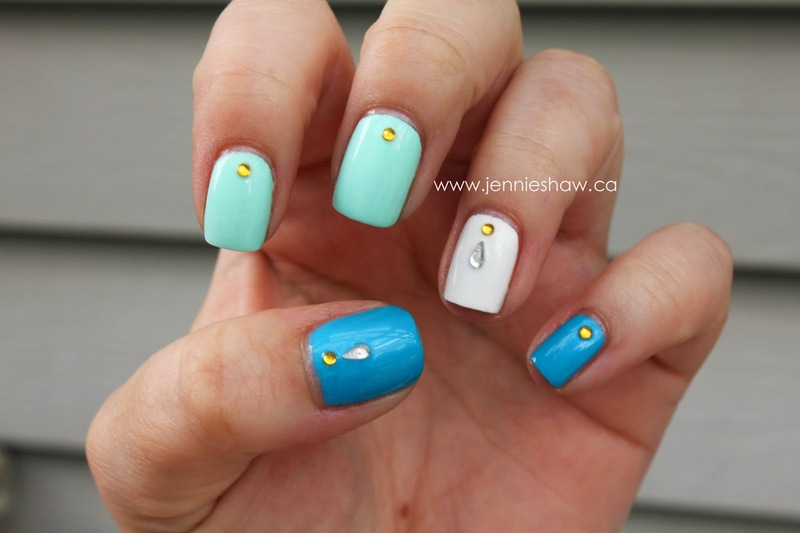 The coolest part of this mani, is that the rhinestone combo looks like an exclamation point! And since that's my favourite punctuation ever, it's quite fitting that I'm rocking them. Haha! YAY FOR EXCLAMATION POINTS! And on another note, a super awesome email got forwarded to me this week, which originated from the Highlands of Scotland. Apparently, there are some nail polish enthusiasts up there who were inspired by the nail files, and look what they managed to do! So cool, eh?! Great job, Jessie (and assistant)! Hope you had a super fun time at the summer disco! What are you rocking this week? Link up and show em off! And if you live in the US of A, Happy 4th of July! Yay fireworks! Yep your nails and exclamation points are AWESOME!!!! My nails are naked. Since my husband thought he would pull a hangnail off my fingernail. Which it hurt like no other. I posted a comment this morning and....yeah. The internet ate it haha! This is THE BEST THING EVER! I'm also partial to exclamation points and I'm in love with these colors and the design!!! Perfect mani, friend! Looks cute. I'm trying to do my blog post, but my computer is acting crazy. Oh YAY! Damn- I had SO many rhinestones after making a Venetian mask for an SCA event...I never thought about putting them on mah nails! Brilliant! I gave them to a drag queen friend of mine instead. Ah, well. 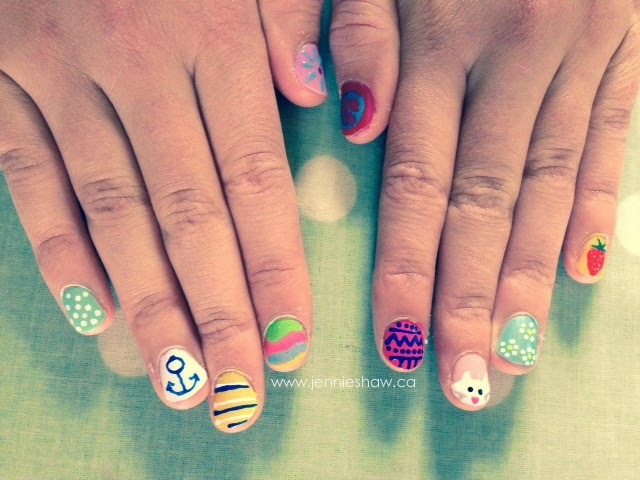 Exclamation point mani FTW! Hey, does that teardrop mean you killed someone in a salon? Another week of beautiful nails, I absolutely love them. Great colors & love the bling too. Thanks for hosting the link up and have a great evening. Beautiful mani - simply elegant!